Exchange out-of-the-box does support SPF checking, but DKIM signing/verifying and DMARC verifying are not supported. There are free 3rd party tools for DKIM Signing that can be found on GitHub, but at the moment of writing this tool only supports DKIM Signing, but does not support DKIM verifying. I have to admit that DKIM signing with this tool works very well. Figure 1. My testlab Exchange environment. All outbound SMTP mail is via the ESA. The FQDN of the ESA is smtphost.exchangelabs.nl, of course it has a public IP address with a corresponding PTR record. 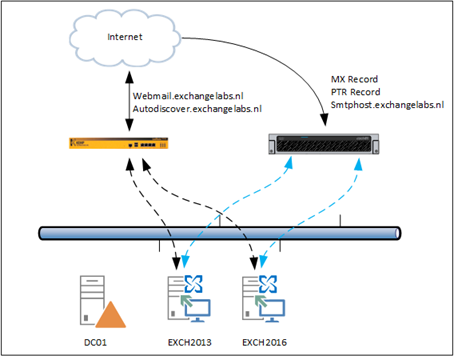 There are two Mailbox servers (Exchange 2013 and Exchange 2016) and two Edge Transport servers (also Exchange 2013 and Exchange 2016). 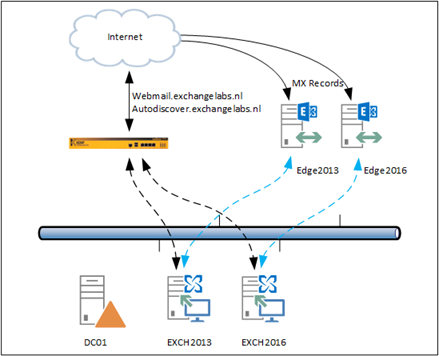 MX records point to both Edge Transport servers and there are two Edge Synchronizations. And the Edge Transport servers were capable for DKIM signing (as posted in a previous blogpost), but lacked DKIM verification and DMARC validation. The most important part in the Edge Transport server is the Real Time Blocklist, configured to use Spamhaus for connection filtering. While this works pretty well (there still is quite some spam that gets delivered into mailboxes) there is always room for improvement. I have been looking at cloud solution, but they didn’t always deliver what was expected.